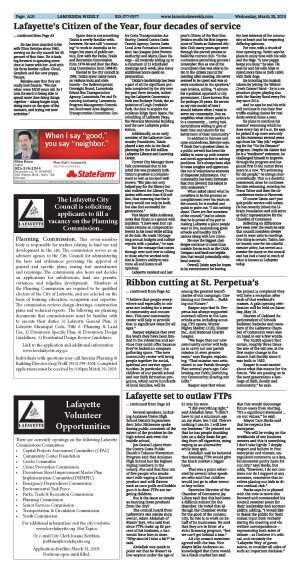 Lafayette is moving closer to banning flavored tobacco products and implementing a tobacco retailer's license. The council unanimously agreed with an in-depth staff report, called for in December, recommending that the city ban FTPs and adopt a TRL, and requested that the staff bring back a draft ordinance with language clarification to the April 8 meeting. 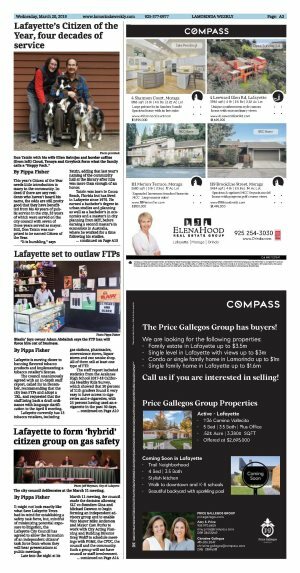 Lafayette currently has 13 tobacco retailers, including gas stations, pharmacies, convenience stores, liquor stores and one smoke shop. All of them sell at least one type of FTP. The staff report included statistics from the Acalanes High School 2017-18 California Healthy Kids Survey, which showed that 50 percent of 11th graders found it very easy to have access to cigarettes and e-cigarettes, with 25 percent having used an e-cigarette in the past 30 days. Several speakers, including Acalanes Union High School District Superintendent John Nickerson spoke during public comment of the extent of the problem in the high school and even the middle school. Jen Grand-Lejano from the Contra Costa Public Health's Tobacco Prevention Program said that Acalanes High School has the highest vaping numbers in the county. She said that four out of five people who smoke start with vaping a flavored product and with flavors such as coco puffs and bubble gum it is clear FTPs are targeting children. But is the issue as simple as banning these products from the city? 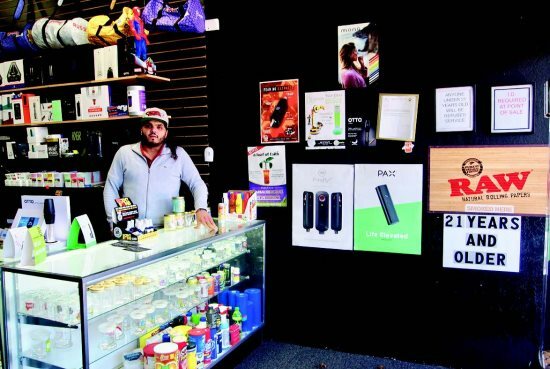 The council heard from Lafayette's one smoke shop owner, Adam Abdallah of Blazin' Jayz, who said that since FTPs make up 85 percent of his business, a ban would force him to close. "Why should I take a hit?" he said. Abdallah was quick to point out that he doesn't allow anyone under the age of 21 into his store. "I did everything right," said Abdallah later. "I didn't have to put a minimum age on my store, but I did. There's nothing I can do. I will lose my business." He pointed out that he has people thanking him on a daily basis for getting them off cigarettes, using vaping as an alternative while they quit. Abdallah said he believed that banning FTPs would give the black market a bigger hand. That was a point reiterated by several other speakers who said that children would just go to other towns or buy online. Executive Director of the Chamber of Commerce Jay Lifson said that this had been a difficult subject for the chamber. He noted that although the Chamber works for the good of the community, its role is to work on behalf of its businesses. He said that they are in favor of a strict licensing program, "but we can't get behind a ban." All city council members agreed with the ban. Vice Mayor Mike Anderson acknowledged that there would be a black market but said that this would discourage future users from starting. "It's a significant statement . on our values," he said. Mayor Cam Burks said that he respects free enterprise. "We will be voting on the livelihoods of our business owners and this is something I don't take lightly. I deeply respect and believe in free enterprise and vibrant, unregulated commerce as a key, fundamental policy basis for our city," says Burks, but adds, "However, I do not condone nor do I support at any measure, commerce that involves placing our kids in direct medical risk." Burks says he is pleased with the vote to move this forward and commended his council member peers for their leadership and accountability, adding, "I would like to thank the public for their robust input both verbally during the meeting and via written correspondence - representing both sides of debate - as I believe it's critical, and certainly the `Lafayette Way' of governance, to consider all sides of such an important decision."